1 of 1 In a small bowl, mix tequila, oil, lemon and lime juice, garlic, cilantro, salt and pepper. Combine with steak in a resealable plastic bag and marinate, refrigerated, for 2 hours. 1 of 2 Combine vinegar, oil, cilantro, parsley, onion, red pepper, garlic, basil, oregano, pasilla chiles, pepper, salt and cumin in a food processor. Pulse until coarsely chopped; let sit for 2 hours at room temperature. 2 of 2 Heat grill or grill pan to high heat. Cook steak to medium-rare, about 8 minutes, turning once. Let rest 5 to 10 minutes then slice across the grain into 1/4-inch pieces. 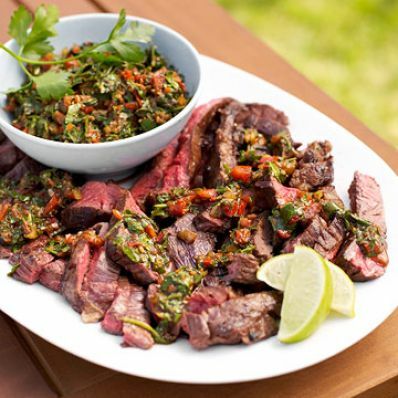 Serve topped with Chimichurri sauce.